A special slow cooker for preparing your favorite recipes! 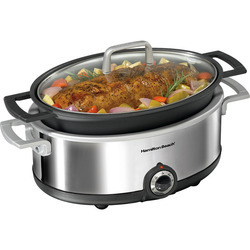 The Hamilton Beach Premiere 5.5-Quart Oven-Safe Slow Cooker is a perfect electric slow cooker to handle a variety of delicious meals with little preparation effort and time. Removable liner In this slow cook crock pot can be used on gas, electric, and ceramic ranges or in the oven. All-in-one cooking Accomplishes browning and then cooking in the same pan to save time and cleanup. Aluminum material Offers even heating and non-stick features. Oval design Accommodates a 6 lb. chicken or up to a 6 lb. roast....small to large recipes. Glass lid Lets you watch the progress without uncovering the crock pot and reducing the cooking temperature.